Farmers in certain parts of the south-west of England can occasionally turn up pieces of Ammonite fossil as they plough their fields, but a farmer from Michigan came up with an elephant-sized surprise when he and a neighbour were digging in their soya bean field. They have unearthed the partial skeleton of a male Woolly Mammoth, one that is believed to be between 10,000 and 15,000 years old. However, upon closer inspection the strange object, started to look more like bone. It turned out to be a rib bone from the extinct elephant. The grandson came over to take a look and he was speechless, quite a feat when you consider just how noisy most five-year olds are. Mammoths and Mastodons roamed North America until the latter stages of the Pleistocene Epoch, this specimen may represent one of the last Woolly Mammoths to have lived in this part of this world. Just a few thousand years, perhaps in this animal’s case, just a few hundred years later, all the prehistoric elephant species of North America had become extinct. 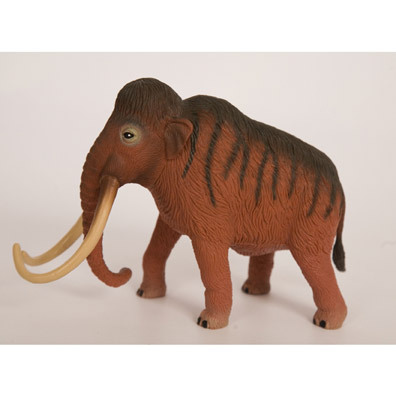 Woolly Mammoth model, typical of this type of prehistoric elephant. University of Michigan Professor Dan Fisher has been leading the excavation, to remove the animal’s remains before exposure to the air invites further decay of the bones and teeth. The partial skeleton consists of the skull, pelvis, two, huge curved tusks, the shoulder blades and numerous vertebrae and rib fragments. About thirty Woolly Mammoth fossilised skeletons have been reported from the State of Michigan. Down in the hole the skull and tusks emerge. Examination of the teeth indicates that the animal was adult and about forty years of age when it died. Speculating on how the body came to be under a soya bean field, palaeontologists have explained that the surrounding matrix suggests a still body of water. This animal could have been hunted by humans, butchered and then placed in a pond to help preserve the meat. Placing a carcase in water to help preserve it, is believed to have been a relatively common practice amongst the human inhabitants of North America. The water would perhaps have iced over quite soon after the kill and the cold water and ice would have kept the meat relatively fresh. According to Professor Fisher, the soya bean field discovery represents one of the most complete Woolly Mammoth skeletons ever found in the State. Once all the bones have been removed, they will be carefully examined and a detailed analysis undertaken. The scientists will hope to find tell-tale marks in the bone to indicate human butchery. On the surface, a ventral view of the skull.